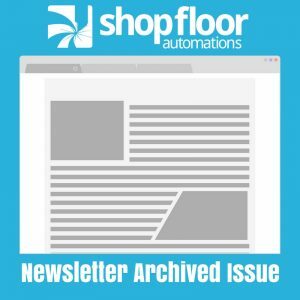 The following is an archived copy of the Shop Floor Automations Newsletter – March/April 2015 issue. Please join Shop Floor Automations and our partner Smartware Group for a webinar on one of the most modern maintenance management solutions available today, Bigfoot CMMS. Keep your shop floor running in peak performance and upgrade your Predator Software. Since February 2015, several new versions have been released. Be sure to check out our support section on our website for the release notes. Contact your Account Manager before upgrading to confirm you have the proper license, hardware and backup in place. If you are on a current software maintenance and version upgrades agreement, the new version is available at no charge. If not current, please contact Paula at ext. 1000. Simplify the communications on the shop floor with our USB Connect device. Plug in the USB memory stick with the NC program, select the button to transfer and you’re cutting chips with ease. Did we help your company achieve its goals? Did we do a good job? Did one of our technicians go above and beyond the scope of work? We would love to hear about it! Perhaps you could send us some feedback that we can post on our new website – and include your name and company. Just reply to this email. If you include your t-shirt size, we’ll send you a free G-Code t-shirt! While we’re on the topic of performance, if we fell short of your expectations, we would like to hear about that as well – so we can make the necessary adjustments to our operations.